Being a copy editor must be the worst job in all of publishing. Some people just have the knack for it, but I could not imagine combing through 1000s of words and 100s of pages looking for the tiniest grammar mistakes. God bless these unappreciated and underpaid word-freaks. They have to be the most meticulous people on the planet! That being said, it must have been incredibly hard for the copy editor of Don Cherry's new book Don Cherry's Hockey Stories and Stuff . You see, Don Cherry agreed to the book under one stipulation. "I wanted the book to be like a couple of guys sittin' down with a few pops tellin' hockey stories." Cherry, famous for butchering the English language, wanted to tell the stories "in my own language." "I got to be me" he insisted. So Don goes rambling on, tirades in several direction, losing focus and going off on tangents. Al Strachan transcribes it all rather than writes it, complete with all of Cherry's sentence fragments, wrong tenses, mispronounced words and names, comma splices, misplaced modifiers, past participle errors and all those other things that drove us all nuts back in high school. And the copy editor just had to leave it all there, no doubt driving him or her absolutely crazy page after page. The end result though is Cherry's charisma is completely evident in the book. Essentially, Coach's Corner comes to paper. Reading the book from cover to cover might be a bit of a challenge. 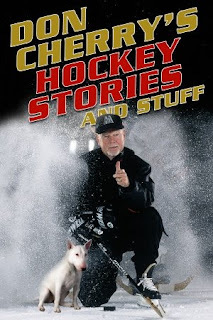 Because Cherry goes all over the place (remember, "guys sittin' down with a few pops tellin' hockey stories"), there is absolutely no structure to this book. It's all just there, story after story, presumably in some sort of order but tough to determine. There is no table of contents or sections by theme, which might have made some sense. It is all just . . . there. The critics are going to be all over this book. Cherry has no end of critics to begin with, but now with is decision to publish the book with such poor English will no doubt draw the ire from many more people, especially educators. Kids love Don Cherry. Reading this book might reinforce bad grammar habits that have long plagued North America. I would not worry about it though. Accept this book for what it is. It's Don Cherry telling some hockey stories. And stuff. He's got some pretty funny stories here. I especially enjoyed stories of when he first got out of coaching and on TV, and how he did a speech circuit to make ends meet. In addition to being funny in some way it humanized Cherry somehow. I think the book allows us to see more of the real Don Cherry than the character we see on TV. I think an open-minded reader will develop more respect for Cherry as an intellectual and as a family man and as a proud Canadian. The book offers basically a glimpse of this, but it is nice to know Cherry is more than just the buffoon he is on television. My advice on this book is pretty simple. If you do not like Don Cherry, do not buy the book. You will not like it. There are plenty enough Don Cherry fans out there to make this book a best seller without you. this review had me laughing out loud and overjoyed to possibly receive or buy myself the book. I am a high schooler from the states and (despite the desire for "scholarly/intellectual" topics, i have chosen to write my thesis on fighting in NHL hockey. Maybe not the greatest source to site, however, hopefully one of inspiration! I love your view and and all on the book. I think you got right on the button. I read the book and your reight, the storie has no structure what so ever. Thats what makes it so Don Cherry like. This is the worst review on this site, but it is that way because clearly the writer is not a fan of Cherry. I was, and i loved the book. A must buy for anyone who loves watching Don Cherry. And there actually is some flow between many stories - just not to the extent of books like "open ice"